If you own a young horse, you are probably anxiously awaiting the day when you can ride him. Breaking a young horse too early can lead to soundness problems later in life, but if you wait too long your horse may be difficult to train. It is important to work with your trainer and your veterinarian to determine when your horse is ready to ride. Young horses should not be ridden hard until they have physically matured enough to safely carry weight. For most breeds, this will occur when the horse is approximately 2 years old. Some trainers choose to start training when the horse is a late yearling, meaning he is between 18 and 24 months of age, while others will wait until a horse is 2 1/2 before training starts. Regardless of the age of the horse, it is essential that you do not ride a horse whose knees have not finished closing. If your horse's knees have not closed, it means that the knees have not fully developed and are extremely vulnerable to damage that can occur as a result of putting too much pressure on the joints. When horses are ridden too early, it can damage their joints and affect their soundness for the rest of their lives. Your veterinarian will be able to tell you if your horse is physically ready to be saddled and ridden. Once your veterinarian gives you the OK, you will need to spend time teaching your horse to accept the saddle and the bridle. This is generally done by gradually introducing the horse to the necessary riding equipment one piece at a time over the course of several days or weeks. After your horse has accepted the equipment, your horse trainer will get on your horse and teach him how to accept a rider. Some breeds of horse mature earlier or later than the average horse. 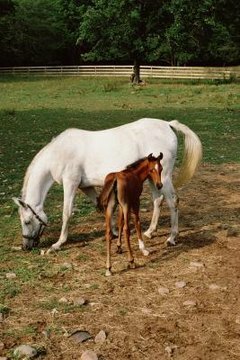 Thoroughbreds mature slightly earlier than quarter horses and other similar breeds. They are broken to ride starting around 18 months of age so that they are ready to race as 2 year olds. Warmbloods and draft horses mature later than average and may not be broke to ride or pull wagons until they are 3 to 4 years old. How Much Should a Yearling Weigh?